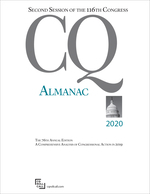 Since it was first published in 1946, CQ Almanac has been the definitive annual reference for studying the U.S. Congress. Building on the reporting and analysis done throughout the year by CQ's award-winning news staff, the Almanac offers original narrative accounts of every major piece of legislation that lawmakers considered during a congressional session. Arranged thematically, CQ Almanac organizes, distills, and cross-indexes for permanent reference the full year in Congress and in national politics. Its clear and concise language makes the Almanac an essential resource for scholars, journalists, interested citizens, and students of the U.S. legislative system. To learn more about the photographs used in the CQ Almanac Online Edition please visit the credits page.